March 6, 2014 – April 1, 2014. Opening reception March 6. The AXIS gallery and event venue in the historic Pioneer Square neighborhood of Seattle, will be hosting an exhibition of literature themed artwork from 100 distinct, contemporary artists. Ex Libris: 100 Artists, 100 Books, presents a collection of newly realized works that are drawn from the pages of favorite books individually selected by the participating artists. This collection of artwork was created to celebrate the presence of The Association of Writers & Writing Programs (AWP) conference in Seattle, February 2014. Each year AWP holds its Annual Conference & Bookfair in a different city to celebrate the authors, teachers, students, writing programs, literary centers, and publishers of that region. AWP is the largest literary conference in North America. The presence of AWP in Seattle gave rise to the idea of Ex Libris: 100 Artists, 100 Books, an opportunity for the visual arts community to participate in this literary tradition and to celebrate the many ways in which literature has enriched our lives and informed our practice as art makers. A selection of works from the Ex Libris collection will be on display at the convention center during the conference. All 100 works of art will be on exhibit at AXIS beginning March 6th, 2014. In this body of work, many genres of literature are represented from non-fiction to sci-fi, romance to biography. Some artists chose to depict specific characters from favorite books, for example artist Amy Huddleston’s interpretation of the Charles Dickens’s novel Great Expectations centers on the eccentric character Ms. Havisham. In Huddleston’s painting a sloe eyed Ms. Havisham holds court bedecked in feathers and fur. Other artists interpreted this challenge by re-imagining the covers of their favorite books. 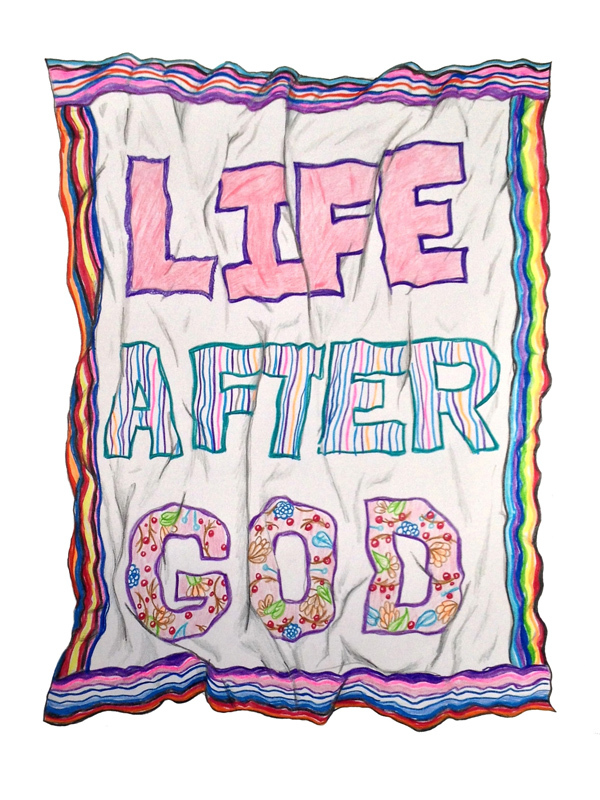 Artist Joey Veltkamp used the title of his inspiration book, Life After God, to bring Douglas Coupeland’s work to life in a drawing based on a textile creation. Through painting, drawing, and sculpture, these 100 Artists pay beautiful homage to the books and authors that have entertained, edified, and informed them. Join us at AXIS in Pioneer square during the month of March to see this whole collection. The opening reception for Ex Libris: 100 Artists, 100 Books, will take place on March 6th, 2014 from 5 to 9 PM. The artists will be in attendance at the opening reception and readings from local authors will take place. Among other activities, a costume contest with prizes for best author and librarian will occur. For more details about the exhibition and a complete gallery of all the work, please visit the exhibition website. Seattle based sculptor and photographer, Miguel Edwards first became involved with the Northwest Flower and Garden show in the late 90’s. At that time he worked behind the scenes at the show pushing a broom, carrying plywood, and working at a variety of general labor jobs wherever he was needed. Over the years Edwards became more involved with the show often taking on the role of general trouble shooter, forklift driver, interiors manager, heavy equipment manager etc. In 2009 Miguel began to see a shift in his fine art efforts. Though historically his primary discipline was photography, sculpture became the new focus of his artistic process. Because of this artistic shift he began to see the Northwest Flower and Garden Show in a new way and he became more aware of the possibilities that the show offered for him to showcase his sculptural work. Over the last four years Miguel has worked with various garden exhibitors. At the 2013 Flower and Garden Show, Miguel Edwards worked with Dr. Decks, their successful collaboration, Alien On Vacation – Xenomorph Meets Earth’s Most Lethal Plant Colony, received the South Sound Magazine Editor’s Choice Award, the only editor’s choice award given in 2013 (Edward’s sculpture for the display, Advena Vasculum, was a collaboration with Ryan Blythe). In past years he has also collaborated with In Past Years Miguel has collaborated with noted garden creators including Karen Stefonick, and Redwood Builders LLC. Other Members of the Award winning Team include Rex Saathoff, Chris Hoover, Kevin Russell, Jerome Brown, Calvin Russell Greg Barthels and Tracy L Korenski. This year Miguel Edwards is returning from a successful showing of his sculptural work at the Archangel Gallery in Palm Springs and he is ready to participate in the 2014 Flower and Garden Show. He returns, this time as a garden creator with the Dr. Decks team which has been selected as one of the 2014 display gardens. The Dr. Decks team is presenting: A Conduction of Vigorous Immersion – Seattle’s Best Artists Enhance Your Flow. This garden includes integration of the first ever permitted of fire and water feature at the show (or ever in the convention center), Monument scale solar kinetic sculptures and hand-blown glass pieces , neon and deck automations, including a retractable powered Seahawks table that stows directly into the deck as well as the worlds first ever ADA speced wheelchair ramp that switches from ramp to stairs and back at the push of a button. Many firsts with this team. 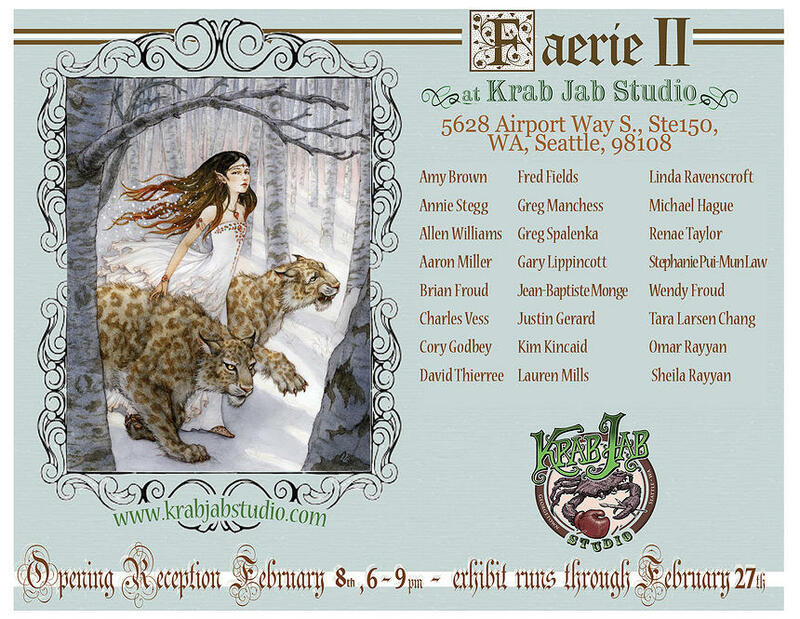 For the second year in a row, Krab Jab Studio is playing host to the magic and mystery of the fae with FAERIE II, a collection of work from many of the best known faerie artists in the world. 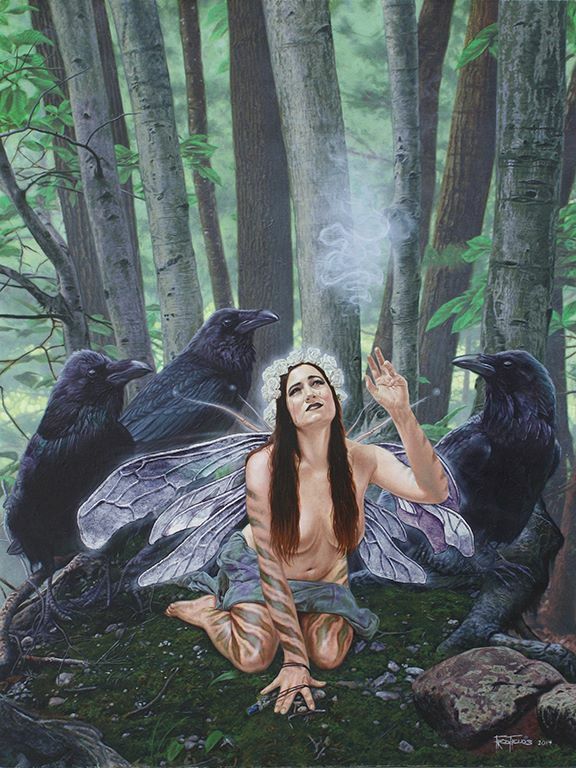 Seductively appealing, yet dangerous to actually discern, the realm of the fae continues to seduce and compel, frighten and intrigue – to draw in those who may sense that there is more ‘out there’ than what we experience through our five senses. Curated by illustrator Tara Larsen Chang, this new assemblage of two and three dimensional art explores both the enchanting and the enigmatic elements inherent in the denizens of faerie. Amy Brown, Annie Stegg, Allen Williams, Aaron Miller, Brian Froud, Charles Vess, Cory Godbey, David Thierree, Fred Fields, Greg Manchess, Greg Spalenka, Gary Lippincott, Jean-Baptiste Monge, Justin Gerard, Kim Kincaid, Lauren Mills, Linda Ravenscroft, Michael Hague, Renae Taylor, Stephanie Pui-Mun Law, Tara Larsen Chang, Omar Rayyan, Sheila Rayyan and Wendy Froud. Opening reception will be part of the February Georgetown Art Attack! February 8th 6 – 9 pm. Be sure to stop by!